Now you can take your projector outdoors and have yourself your very own outdoor cinema. We look to new wireless projectors in this instance. Innovative portable projectors that use LED technology now offer families the opportunity to watch high definition movies outdoors. To date projectors have been made to work exclusively indoors, but with forward thinking projector manufacturers integrating new features such as wireless connectivity allows the projectors to connect to the home WIFI or even your cable box, thus allowing you to watch your favourite television programs and never missing a football game! Ideally if you can acquire a projector that can be seen run on battery power you can now display movies outdoors, but the technology is not quite there yet. Depending on how the projector is located it may use more battery power to cool the projector internal parts. So the first thing to find is a projector that is wireless enables and had a sufficient battery, alternatively you need to secure a projector that runs on electrical power and will have to be hard wired into position. Deploying a projector outdoors permanently. When a standard projector is deployed outside, the route to the location from the main house to the area in the garden has to be planned, then a trench dug and cable conduit laid into the trench. Then both the power and data cables are laid in separate ducts, if they are laid in the same duct the electrical cable will slow the data rate down for the internet connection. If you do not have a weatherproof projector, you will need some kind of projector housing that provides all weather protection. So once the projector is installed it can be left outside all year round. Perfect if you locate the projector screen near a hot tub as this can be used throughout the year. Projector enclosure for home projectors. ProEnc offer a solution from their portfolio of projector enclosures that protects the projector irrelevant of the make or make, so most projectors can be used for your home entertainment. ProEnc’s projector enclosure for home use will accommodate projectors up to 10,000 ANSI Lumen and up to a size of 20” wide x 22” deep x 10” high. 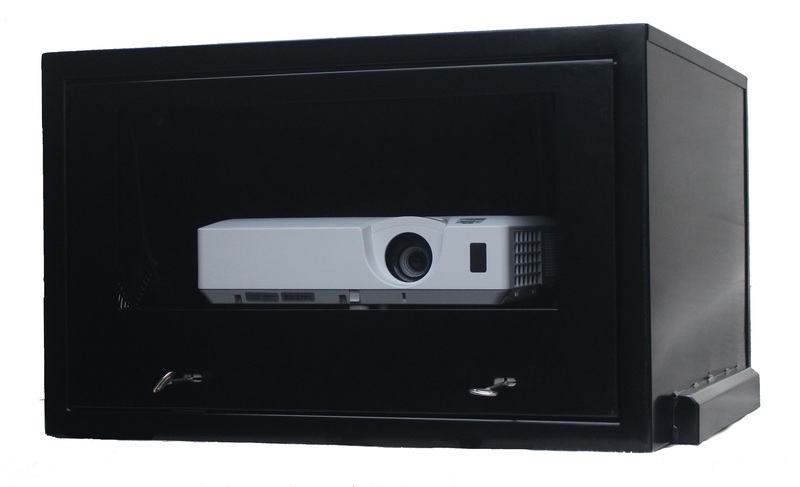 The outdoor projector enclosure is made from steel and powder coated in an epoxy powder coating in their standard white colour. We all know that anyone can make a box and we have seen them in the form of wooden outdoor projector enclosures, but as we all know that a wooden box cannot be sealed to prevent water entering the housing and damaging the projector. This is why ProEnc use steel and this is fully welded providing a NEMA 4X or IP65 solution. Thermal management of the projector enclosure. Due to projectors putting out a lot of heat, efficient cooling is essential to prevent hardware failure. Now ProEnc have a tried and tested cooling solution that is thermostatically controlled, the cooling system exhausts the hot air and then clean, fresh air is drawn into the enclosure. Condensation build up is eliminated using ProEnc’s thermostatic heating system, this is controlled by the customer and thermostat, so they can control the temperature depending on geographical location. Contact ProEnc on (862) 234-5981 to discuss your projector enclosure requirement enabling you to take your projectors outdoors.